With the evolution of ArcGIS into a true web GIS, GIS managers now need to motivate people throughout their organizations to adopt geospatial technologies. This challenge is also an opportunity for engaging a new ecosystem of users. Turning opportunity into reality requires a new way of positioning GIS so that it will be adopted by people who would not traditionally be GIS users. Change is difficult. People tend to resist change. Applying technology change management principles can help overcome this tendency. Dr. John P. Kotter, Harvard University professor and founder of Kotter International, is a noted authority on leadership and change. Kotter's model for facilitating change is an excellent starting point for managers who want to expand GIS-enabled insights and efficiencies across their organizations. This article discusses how to apply Kotter's insights to create an actionable change management strategy that will help you drive adoption of geospatial technology and applications. Going solo is not an option. A team effort is required to spark interest in and adoption of geospatial technologies across your organization. When envisioning your organization's change management approach, start by considering factors that may inhibit or even prohibit change. Common factors that get in the way are organizational culture, complacency, bureaucracy, and a sense of futility. An ORGANIZATIONAL CULTURE that is structured into segmented silos will inhibit the collaboration needed to effect change. COMPLACENCY is commonly seen with mature teams that have a history of success. A sign of complacency is hearing the response, "The way we do it works fine; we don't need to change." BUREAUCRACY is a common change inhibitor in large organizations and government. By complicating and slowing change momentum, bureaucracy can stall and ultimately kill change initiatives. A SENSE OF FUTILITY results from the combination of the previous three factors. To teams, the prospect of overcoming these obstacles and effecting change seems overwhelming, and doing nothing is easier. Identifying change-inhibiting factors you are likely to encounter is a critical part of building your strategy. You will need to develop key value statements to overcome or marginalize each factor as you work through these steps. To instill motivation, start by creating and clearly communicating a sense of urgency. A sense of urgency is rooted in the "Three Whys." Because the answers to these three questions may vary significantly throughout your organization, the next step is critically important. Depending on who you ask, the answers to the Three Whys will vary significantly. With this in mind, it is important to map your organization and identify stakeholder representatives from multiple business units. For example, the guiding coalition for a local government might have representatives from the planning, fire, police, and sanitation departments. The coalition will provide you with the intelligence you need to understand how GIS can help each team improve its business. The coalition is also instrumental in the next step. If you understand the motivating factors for the various parts of your organization, this step will be much easier to complete. You will find that as you engage other business units via your guiding coalition, you become an aggregator of information. You can use this information to formulate your vision and strategy. It is important to distinguish between vision and strategy. The vision is the adoption of geospatial technologies throughout your organization. The strategy outlines the specifics—who, what, when, where, and why—that together form the plan for achieving the vision. The guiding coalition will help eliminate GIS jargon from your strategy. This is essential for overcoming the factors that inhibit change and winning acceptance from non-GIS teams. The volunteer army is an extension of your guiding coalition. 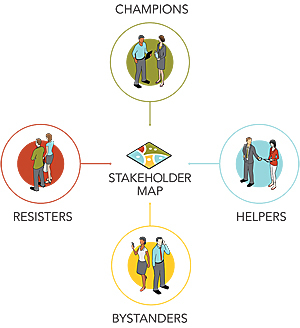 The guiding coalition will conduct a stakeholder assessment of its respective teams to classify people into one of four roles, using the stakeholder mapping model from ExperiencePoint, Inc. CHAMPIONS not only have the vision of how the change will impact the enterprise, they have the leadership capability to initiate change action plans. HELPERS are your guiding coalition and volunteer army. Helpers are willing and able to move the change initiative forward. They have a complete understanding of the change strategy, are able to communicate it effectively, and can gain buy-in from other team members. BYSTANDERS will neither help nor inhibit the change initiative. The majority of the people in your organization will be bystanders. Transforming bystanders into helpers is a goal for a successful change strategy. RESISTERS may inhibit your change initiative. They can be serious obstacles if they have significant influence in your organization. Securing executive buy-in will help minimize resister impact. Ignoring resisters is a critical mistake made by many change champions that gives resisters the opportunity to spread their discontent. Understanding resister concerns will help you to communicate with them and marginalize their resistance. Often, resistance is rooted in perception rather than reality. Transforming resisters into bystanders is a goal for a successful change strategy. After creating your change strategy and identifying your stakeholders, you will address any barriers that may impede the change initiative. One of the most glaring barriers is the need for skills. Will team members be able to immediately use the technology? If not, plan for training to overcome this barrier. Another common barrier is lack of team access to the right technology at the right time. Work with your IT department to ensure the right software is installed on the right systems and that all required permissions are in place. With barriers removed, execute your strategy. As you begin to see results from your initiatives, it is extremely important to collaborate with the guiding coalition to communicate these wins. By engineering your strategy around initial short-term wins, you will help preserve and increase buy-in across your enterprise. Short-term wins help you build momentum as you work toward your vision. For example, someone creates an Esri Story Map app. Share it with the enterprise and encourage others to participate. With story maps, it is easy to create a high-impact visualization of relevant data. Continuing to recognize and celebrate wins is key to sustaining the momentum of a change initiative. Earn more wins by continuously building your teams' skills and creating a culture that encourages learning new workflows. As new, more efficient workflows replace old, inefficient workflows, your workforce will be more engaged. You will need to institutionalize the new workflows your teams have adopted. This is an important step for establishing a long-term strategy for your GIS, and it is often documented in a formal GIS strategic plan. The GIS strategic plan is created using a broader-scale version of Step 3: Form Strategic Vision and Initiatives. This plan will drive the adoption of geospatial workflows and lead to institutionalized utilization of geospatial technologies. Engaging your human resources team to create GIS training tracks for employees may support institutionalized GIS use. Training plans and workforce development plans that are aligned with your change strategy are a valuable tool to remove skill barriers for those new to the technology. Engage your internal training teams to identify skills gaps that need to be addressed. Esri can also help with this. Embarking on a technology change initiative is challenging. Now that you know the seven steps of the change management process, when will you get started? For more information, please contact David Schneider. David Schneider, a training consultant in the Esri Washington, DC, office, works closely with large federal civilian agencies to align workforce training and professional development with agencies' strategic missions. He is currently pursuing a master's of science degree in technology management at George Mason University. Schneider regularly gives presentations on the strategic benefits of workforce development planning, change management, and change leadership.